New Primitives was founded in 2003 by Stanley Kipper, a veteran drummer of the Southern California music scene. Leading up to the formation of the Prims, Stan had established his presence by playing with such legendary acts as Jay Ferguson, Joe Walsh, The Bee Gees, Randy Meisner, Minnie Ripperton, Gypsy and Bill Withers, as well as acting as producer on many albums. 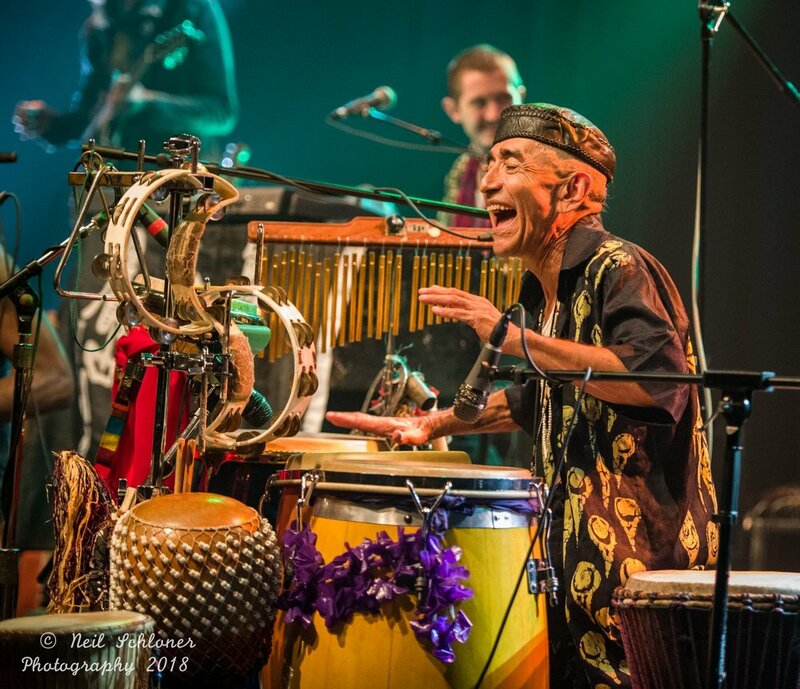 He enlisted long time friend, collaborator, Percussion expert, and former Gypsy bandmate Chico Perez, who himself had performed with recognizable names like Crow, Seventh Wave, and Colla. With Stan on Drums and lead vocals and Chico on Congas and Backing Vocals they, along with a handful of other musicians formed the initial line-up of New Primitives, and the journey began. The music is a mixture of different genres, Reggae/Ska, R&B, Afro Cuban, World Music, deep Funk and American Rock and Roll. Sometimes all played at the same time. New Primitive live shows are legendary, big fun, hypnotic, dance filled events where the music is designed to bring the performers and the audiences into greater focus and deep into the groove, all day or night long! Prim’s bring a unique vibe unmatched by any of their contemporaries! The band’s eclectic sound can be traced to the diversity seen in the band’s lineup.The band can easily be described as a "Great American Melting Pot” with members from across the country with a broad range of influences. You have the Southern California Pop and R&B of Stan Kipper, the Latin and world elements of Minnesota's Chico Perez, and the New Orleans Funk and Soul influences come from Louisiana man Brian Powers. To top it off New Primitives features Michigan born Andrew Wozniak, Wisconsin’s own Patrick Nelson, and New Mexico native Joe Peterson. Stan and Chico aren’t the only members with excellent careers to draw inspiration from either. Brian “Snowman” Powers rounds out the front line of the band on Saxophone and Backing Vocals. Snowman is a journeyed Saxophonist who’s played with the likes of Blues Traveler, The Samples, & Dave Matthews along with being a record producer who has worked with Grammy Award winning artists such as Darnell Davis & the Remnant, and Victor Wooten. And rounding out the line up are Andy, Pat, and Joe who are some of the most respected musicians in Minnesota. The band's first two records, New Primitives and American Nomads, received nation wide airplay including top ten chart positions across America and Canada. In 2018, New Primitives recorded their third album, a live offering recorded at A440 studios in New Hope a suburb of Minneapolis. This cd will be accompanied by hi-def videos that were recorded on the same night. Those who attended the recording/concert described the show as something they had never seen or heard before! New Primitives have been featured in Relix Magazine, Mpls, St Paul Magazine, Minneapolis Star tribune, the St. Paul Pioneer Press. The band has performed all across the midwest and recently to the west coast. New Primitives have performed/toured with Taj Mahal, Ziggy Marley, Neville Brothers, Mickey Hart, The English Beat, Black Uhuru, Ivan Neville's Dumpsta Funk, Medeski Martin and Wood and many others. New Primitives are a four time Minnesota Music Award winners and the band features two St. Louis Classic Rock Hall of Fame members and Midwest Rock and Country Hall of Fame inductees in Stan and Chico. This collection of talent have proven themselves to truly be one of Minnesota’s best kept secrets, and soon the world will know New Primitives!